Hedge funds continued to underperform the overall US equity market this year. 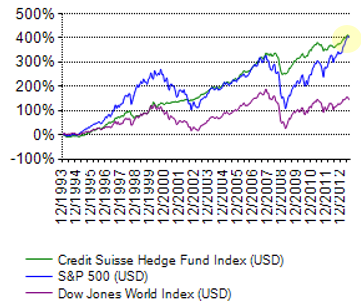 In the first six months of 2013, the S&P500 index is ahead of the CS Hedge Fund Index by over 10%. That is not entirely unexpected during a bull market however - as was the case in the 90s. Just holding short positions - whether in long-short strategies or as risk-reducing positions - should result in underperformance. The fact that the hedge fund universe includes credit, fixed income, and other non-equity strategies makes it difficult for a broad group of hedge funds to outperform in a bull market. Here is what the CS Hedge Fund Index breakdown by "sector" looked like over time. Over the past 20 years however (since the beginning of 1994), hedge funds (at least as determined by the CS HF Index) and the S&P500 performance is nearly identical through Q2 of this year. Both indices are showing about 8.6% in annual returns. Of course if one stuck it out for 20 years in these investments (reinvesting dividends and distributions), the path of achieving the 8.6% return would have been dramatically different between these two. The monthly return volatility for the S&P500 is nearly double that of the hedge fund index. And while the correlation between the two indices is almost 0.6, the beta of the hedge fund index has consistently been low - about 0.33 over the 20 year period. In fact some portfolio managers view their hedge fund exposure as a low-beta stock (over a long period). An even more important consideration for risk-adjusted performance is the maximum drawdown - the largest peak-to-trough decline. 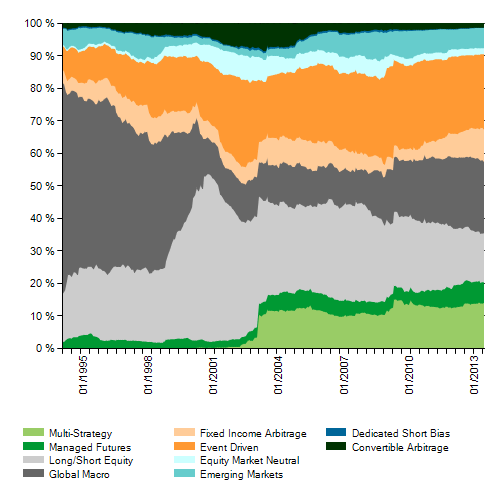 Drowdowns have been considerably worse for various equity indices relative to hedge funds. For example the Dow Jones World Index (global equities) still has not fully recovered its 2008 losses. All the media noise and the scandals aside (and in spite of the high fees), the diversified hedge fund index still shows better risk adjusted performance over the long term. The 8.6 % annual performance by itself doesn't tell one how scary the ride has been in the past couple of decades.